Seeking a third term, Sri Lankan President Mahinda Rajapaksa on Thursday announced presidential elections ahead of schedule. The decision to hold presidential polls, expected in January next year, comes two years before the expiry of 69-year-old Rajapaksa’s current six-year term. “I am declaring a secret today. I have signed the proclamation calling for the election, for re-election for the third time. That is democracy,” Rajapaksa said on television Thursday. Having secured a second term in 2010 on a wave of popularity after the military defeated Tamil Tiger separatists, ending a 26-year civil war, Rajapaksa rewrote the Sri Lankan Constitution to remove the two-term limit on presidency. 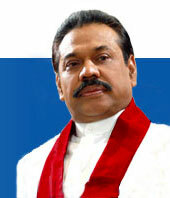 Rajapaksa has been the island nation’s president since 2005. Under Sri Lanka’s Constitution, the president can call for fresh elections after completing four years of a term. The country’s Supreme Court upheld this law earlier this month, paving the way for Rajapaksa’s announcement. This latest development has come amid signs that he and his United People’s Freedom Alliance are politically vulnerable. In the local elections held in September of this year, his party suffered its worst loss, losing about 20 per cent support among voters. On Wednesday, Rajapaksa’s ally, the National Heritage Party, had announced its exit from the government. As the main party of Buddhist monks, its departure could damage his support in a country where Buddhists comprise 70 per cent of a 21.8 million population. It was J.R. Jayawardene, Sri Lankan president from 1978 to 1989, who introduced the system of executive presidency in the country. According to critics, executive presidency gives the President too much power. Rajapaksa had on Wednesday, November 19, used his executive powers to release five Indian fishermen sentenced to death by a Sri Lankan court on charges of drug smuggling. The fishermen were believed to have encroached upon Sri Lankan waters and were caught by that country’s navy, who slapped drug peddling charges on them. In India, the development is seen as a major diplomatic victory for the new Indian Prime Minister Narendra Modi. Rajapaksa’s decision to pardon the fishermen reportedly came hours after Modi spoke to him on the phone.